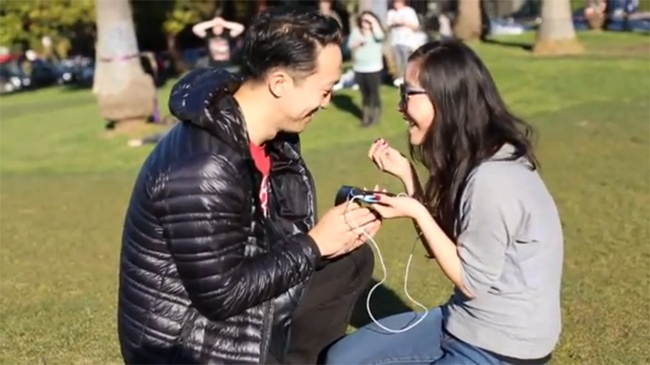 Aptly titled ‘A Twitbook Proposal’, this 9-minute video features Twitter staffer Genevieve Wong being proposed to by longtime boyfriend and Facebook employee, Jon Park. If watching wedding proposal videos is already part of your routine, this one would make a great addition to your list simply for its uniqueness. If you don’t know how Graph Search works, this sort of doubles as a tutorial to help you navigate through the new Facebook service (and help you easily find photos with your significant other so you can properly chronicle your life story together). Park employed real genius by using products that were developed by the companies they worked for, proving that social media should not be shunned as a tool that takes the romance out of real-life relationships. In fact, much like email and video chatting, sites like Facebook and Twitter help long distance couples cope better with their relationship—just ask these folks. Thanks for demonstrating why social media is so awesome, Jon and Genevieve – and congratulations!